Born near the French-Belgian border in the province of Hainault, the region that produced a remarkable number of Renaissance composers including Josquin and Lassus. After being trained in both music and law at either Paris or Cambrai, Compre became a singer in the Milanese ducal chapel of Galeazzo Maria Sforza in the 1470s. When that service was interrupted by his patron's assassination, Compre returned to France to serve in the French royal chapel under Charles VIII. In 1494, he accompanied Charles on that monarch's none-too-successful Italian invasion to reclaim Spanish-controlled Naples for France. 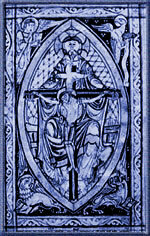 He spent his later years holding posts at several institutions including the collegiate churches of Cambrai and St. Quentin.